Marinating is a great way to add flavor to your favorite food. Plus it’s thrifty, since you can choose less expensive cuts of meat without sacrificing taste. The only downside is that marinating has traditionally required advanced planning. And if you’re like us, the dinner menu is often decided minutes before mealtime, not days in advance. With today’s Grommet you can speed up the process and enjoy flavorful meat, fish, chicken and vegetables in the amount of time it takes to heat up the grill. Simply add your food and sauce to the Instant Marinater dish, then pump out the air to create a vacuum. The vacuum opens up the pores and fibers of the food, allowing the marinade to penetrate quickly. The Instant Marinater also does double-duty as a storage container. If you pump out the air that makes food go stale, your cookies and crackers will stay fresh even in wet weather. The inventor of the Instant Marinater is Bernd Schneider, whose first product was a revolutionary device he developed to preserve opened bottles of wine. Vacu Vin also responsible for the handy pineapple slicer we featured earlier this year. We can’t wait to see what they come up with next. Hi everyone! At International Innovation Company we pride ourselves on making difficult tasks, like preserving wine in bottles or coring pineapples, as easy as possible. 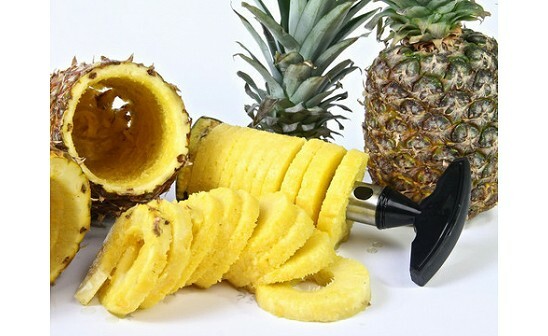 The ingenious patented Pineapple Slicer will peel, core, and slice a fresh pineapple in seconds. Made of restaurant quality stainless steel, the Pineapple Slicer works like a corkscrew, removing the fresh pineapple fruit in perfectly formed rings leaving the core in the shell. One turn, one slice, or the whole pineapple in one go. The shell remains intact for use as a dessert or drinks bowl. No mess - no fuss! Fresh, juicy, perfect pineapple rings in less time than it takes to open a can! We hope you’ll give it a try. Another great Grommet. I love pineapple, I hate how much the shops charge for "pre cut" pineapple, and I've never seen this device before. And pineapple as a snack (instead of, say, a bowl of ice cream) makes great sense. Any device that turns "good-for-you food" into "fast food" is a great idea. I'm heading right over to the 'get it now' button! If this works as well as their large corkscrew it will be fantastic. I've had their corkscrew for years & it works like a charm everytime & is so easy to use. I love it!! I love how you can use the pineapple as a bowl afterward, very clever! How much muscle does it take to start it or pull it out? I love this tool- I can slice a pinapple faster than it takes to open a can. Fresh is so much better, and healthy too. And as the video say, great for Adult drinks as a garnish and mixer. Starting the cutting process just takes a little push. If you position the pineapple on a counter or table at around your waist level, it makes it easier to get some leverage on it. When it comes time to pull the slicer and slices out of the shell, if you wiggle it just a little, it loosens the suction and pulls out simply. I'm thinking this would make a great Father's Day gift...in a basket with a few pineapples. @Rosalie Funny you suggest this as a Father's Day gift. My husband just emailed me asking me to get this for him for his special day. As well as Father's Day and birthday gifts, the Pineapple Slicer can also make a great gift for Teacher Appreciation. Don't forget, graduation parties and summer pool parties are just around the corner. Make beautiful fruit trays in a snap for baby showers and wedding showers and use the empty shells for drinks or decorations! I was at Trader Joe's yesterday and they were demo-ing a fresh pineapple salsa... It was delish and they were cranking out the samples. And what were they using to cut the pineapples? This Pineapple Slicer! The staff member was raving about how it has made her job much easier and she loves i!. There was a crowd around her watching her use it (and waiting for the yummy pineapple.) 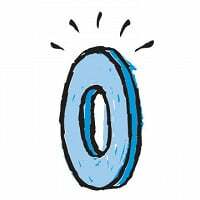 Now I see it on Grommet. Very cool. I'm usually dubious about highly special-purpose kitchen tools; I love to see them but they often aren't worth the room they take up in the kitchen. But this one is an exception. I LOVE fresh pineapple, but it's just such a pain in the neck to peel and core them that I rarely buy them. I'm looking forward to this! Another great feature.....it's dishwasher safe, so clean-up is a breeze! I love the idea about Teacher Appreciation Gift! How many of us struggle also for end of year Teacher gifts. Wouldn't a basket of pineapples, pineaple slicer and some tropical umbrellas be a perfect thank you and kick off to summer for a teacher! I LOVE pineapple but it's such a pain to cut. I love this pineapple slicer/corer. Fantastic!!! 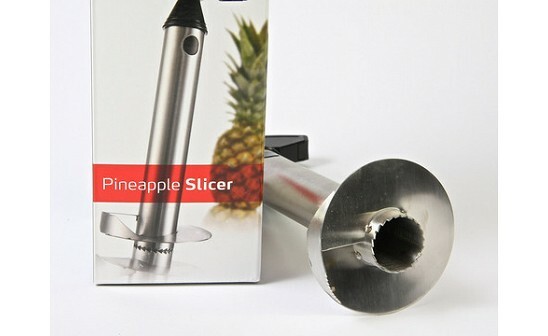 Holly--thanks so much for checking back to let us know the Pineapple slicer is a hit with you. I love this pineapple slicer. It was even easier than the video demo showed. I had fresh sliced pineapple in less than a minute. I just bought a second pineapple so I can use it again tonight. @Beth - Thanks so much for stopping by and sharing your experience with us. Fresh pineapple is such a treat! Love the slicer, can you use it to slice other fruits like watermelon, melon? @Richard The slicer is made specifically for the pineapple, but it would probably work with larger fruit as well. Thanks for stopping by and we're thrilled you like this Grommet! Marinating is a great way to add flavor to your favorite food. Plus it’s thrifty, since you can choose less expensive cuts of meat without sacrificing taste. The only downside is that marinating has traditionally required advanced planning. And if you’re like us, the dinner menu is often decided minutes before mealtime, not days in advance. With today’s Grommet you can speed up the process and enjoy flavorful meat, fish, chicken and vegetables in the amount of time it takes to heat up the grill. Simply add your food and sauce to the Instant Marinater dish, then pump out the air to create a vacuum. The vacuum opens up the pores and fibers of the food, allowing the marinade to penetrate quickly. The Instant Marinater also does double-duty as a storage container. If you pump out the air that makes food go stale, your cookies and crackers will stay fresh even in wet weather.